1. In a small pan, bring water to a boil. Add couscous. Remove from heat for 5 minutes and fluff with a fork. Add remaining ingredients and stir well. Drizzle each serving with a little extra maple syrup, if desired. Shopping Note: Pepitas are flat, green Mexican pumpkin seeds found at Mexican markets, health food stores, and some major supermarkets. Unsalted pumpkin or sunflower seeds make good substitutes. Susan, I love you! Gonna try this cous cous breaky really soon. I've tried quinoa for breakfast, but never couscous. It really sounds delicious. This looks delicious. I'll definitely try it. so excited to see this! i made something similar in january with orange segments and dried dates. yum! I'm totally with you on this one. If it's not pasta, I typically want nothing to do with it. I'd rather just go carb-less. Or have a sweet potato. Or five. 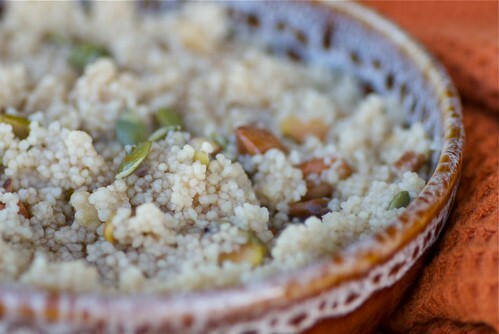 This couscous looks delicious for breakfast though! A definite step up from oatmeal. How interesting Susan. I made quinoa for breakfast before, but never thought of couscous. 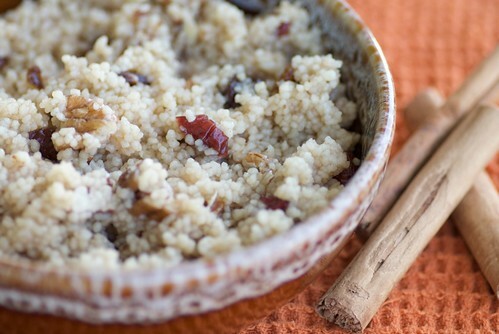 I've never really warmed to couscous, but this breakfast idea is very interesting! Thanks for the prompt to try something different. Great idea Susan! I love couscous, and would appreciate any excuse to eat it during another meal of the day! yum! I've been enjoying quinoa for breakfast lately but obviously the mix-in's are versatile - yours sound wonderful! Great idea, I really like the sound of this! Love this recipe, and thanks for mentioning my breakfast millet! Never would've thought to eat this for breakfast. Love this! Love Couscous! I have some whole wheat couscous I need to try soon. carolyn-Aren't oranges and dates lovely together? rita-You might like it as well. duncan-It may change your opinion of couscous after all. tw-Then this is right up your alley. cara-The mix-in combos are endless. kalyn-I hope you try it. winnie-You're quite welcome. I want to try your recipe too. juliana-It is a refreshing change. foodhunter-I hope you will now! ramblingtart-Millet is on my list. abby-I love that you're teaching Cash such healthful eating habits. chris-You're quite welcome, my dear!